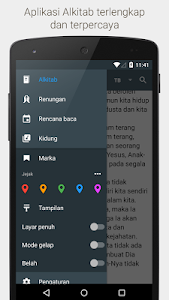 Aplikasi SABDA Alkitab merupakan aplikasi Alkitab Android multifungsi, multiversi, gratis, dan tanpa iklan. 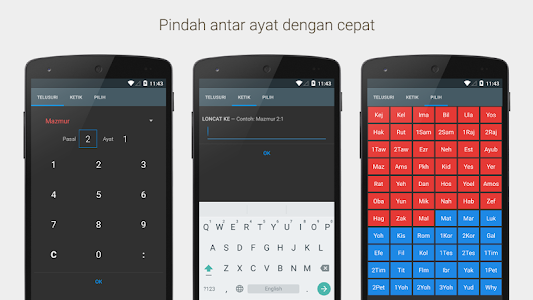 Memiliki fitur-fitur yang lengkap, antara lain: terintegrasi dengan aplikasi Android SABDA yang lain (Kamus Alkitab, AlkiPEDIA, Tafsiran), tampilan dan navigasi baru, pencarian canggih, versi pembanding, referensi silang, catatan pribadi, riwayat baca/pencarian, pembatas buku, salin atau bagikan, sorotan; selain itu aplikasi Alkitab juga dilengkapi dengan berbagai rencana baca Alkitab, renungan Alkitab setiap hari, dan buku-buku kidung/himne. Pengguna dapat menikmati firman Tuhan tanpa harus terhubung Internet kapan pun dan di mana pun -- Bible Everywhere !! Pembatas Buku, Label, dan Jejak. Ada beberapa jenis "bookmarks" -- Anda dapat menandai ayat-ayat yang Anda baca dan membukanya kembali dengan cepat; Anda juga bisa membuat sendiri sistem topik pribadi. Buku-Buku Kidung. Teks dari 15+ buku Kidung/Nyanyian/Pujian. Ada yang dilengkapi dengan "Play" -- untuk mendengarkan musik/lagu bila online. Penampilan/Settings. Tampilan Alkitab dapat diatur sesuai selera -- layar, font, ukuran, dan warna. 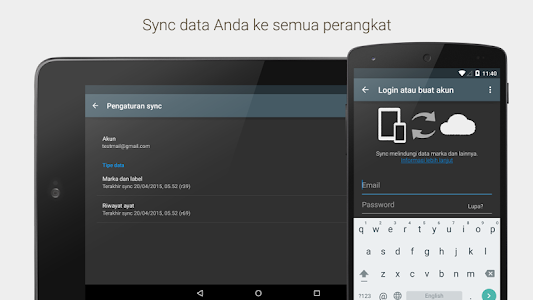 Juga tersedia mode gelap/malam dan layar penuh/fullscreen. 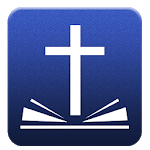 Applications "Bible Yuku" is now also available through the publisher Bible. 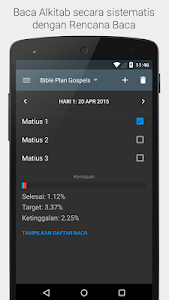 Applications NET Bible is a Bible application Android multifunctional, multiversi, free of charge, and without ads. Features the complete, among others: integrated with the Android app NET another (Bible Dictionary, AlkiPEDIA, interpretation), look and new navigation, advanced search, version comparison, cross-references, personal notes, history read / search, bookmarks , copy or share, the spotlight; besides the Bible app also comes with a wide range of Bible reading plans, daily devotional Bible and hymn books / hymn. Users can enjoy the word of God without having to connect the Internet anytime and anywhere - Bible Everywhere !! Various translations of the Bible. 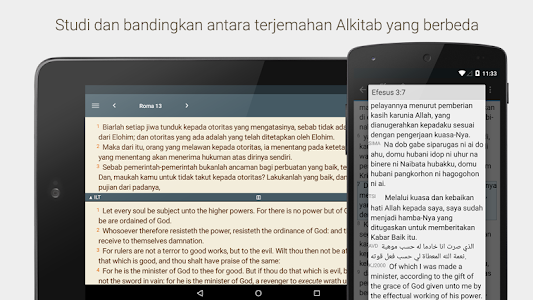 There are translations of the Bible in modern and ancient Indonesian, regional language / ethnicity, native language of the Bible (Yun / Heb), and foreign languages. Each version is quite downloaded / download one time, after which it can be read offline. Search. Search words and phrases quickly and sophisticated. Discover the verses with a variety of search options. Version Comparison. Comparing translations of the Bible displayed with a dual-view 'split screen'. 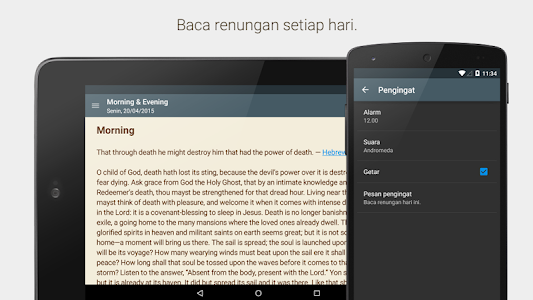 Learn the word of the Lord in different languages ​​with ease in one screen. Cross Reference. Discover verses related, inter-connected in the Bible (for some versions of the Bible translation). Note. 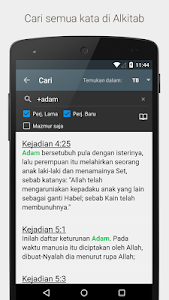 You can make personal notes on any selected verses. History / History. Contains a list of verses that opened before. Last verses that you read has been marked and can be reopened quickly. Bookmarks, Labels, and trail. There are several types of "bookmarks" - you can mark the passages you read and reopen quickly; You also can create your own system of personal topics. Copy / Copy Verses and Share. You can copy / copies of verses, and can also send them through various means (SMS, email, Bluetooth, Facebook, Twitter, and other social media). Thoughts Every Day. Reading devotional every day from a variety of sources, and deepen the knowledge of God's word. Read Year Plan. Choose from a variety of schedules / method / plan, and read the Bible every day according to article / passage / verse specified. Song Books. Text of 15+ books Song / chant / Praise. Some are equipped with a "Play" - to listen to music / songs when online. Appearance / Settings. 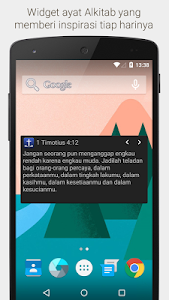 Display Bible can be adjusted according to taste - the screen, font, size, and color. Also available is a dark mode / night and fullscreen / fullscreen. Widget. access the Bible quickly. With the widget get a refresher of passages choices every day.